Palm reading has been around for ages, it is a technique in which an individual claims to be able to read your past present and future, just from the lines that are located on your hands. 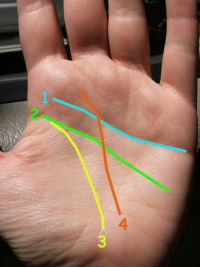 Palms are typically unique to an individual so each person will in theory have a different reading then others. People seem to use Palmist and Psychics to help them grasp the things that are going around them, and give them more of a sense of control. It gives them hope that a love one is waiting for them and they are still love them, or even makes the feel that their bad luck that they have had is not their fault but it is luck and it will end very soon. Palm reading offers individuals with a scapegoat, by saying that because of this line of your palm you are not able to be in a long lasting relationship, even though there could be many other explanations why this individual is not in a meaningful relationship. Also they palm reading claims that changes in your hands line can be attributed to emotional factors in your life. There is no study of course to significantly substantiate these claims. According to Wikihow (http://www.wikihow.com/Read-Palms) on how to read Palms, it explains that if your heart line is breaks at any time, it suggest that you have been through emotional trauma in your life. This is tough to believe that if you go through an emotional hard patch that the lines on your palm will start to shift and change. I used the website to try to read my palm and some of the things ended up being correct but everyone that was correct there were two that were wrong. Much like the Q bracelet that was discussed in the book, if an individual wanted to focus or the correct and ignore the fact most of the information was incorrect or even vague, they could easily fall for such a pseudoscience. In conclusion palm reading is probably one of the best examples of pseudoscience. The entire goal is to take advantage of peoples need to understand anything what is going on around them. It gives people a false confidence in their life that the things that are happening to them cannot be changed because there are greater forces at work. It is suggested that just by the shape and feel of your hand, you are a cold and stubborn person, if that happen to be a correct reading, would it really be that hard for that person to change a little and become more compassionate. I agree with your post. This is such an easy pseudoscience to fall for. I have had my palm read many times for fun and it can make you leave feeling either really confident or really upset.